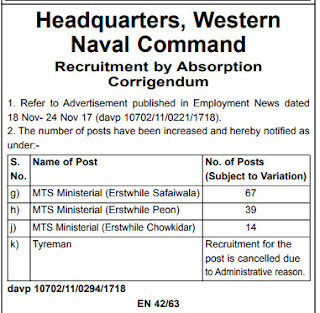 This is the notification of western naval command recruitment of Multi Tasking (MTS) which are increased. Formerly recruitment notice was published in employment news paper by 18 to 24 November 2017. But now vacancies are increased as given below. New increased vacancies are given below. Tyreman : Tyreman recruitment is now cancelled by administration.